There is one important truth that is indisputable, irrefutable, and absolutely undeniable: “mean reversions” are the only constant in the financial markets over time. “Rising interest rates, like tariffs, are a ‘tax’ on corporations and consumers as borrowing costs rise. When combined with a stronger dollar(NYSEARCA:UUP), which negatively impacts exporters (exports make up roughly 40% of total corporate profits), the catalysts are in place for a problem to emerge. 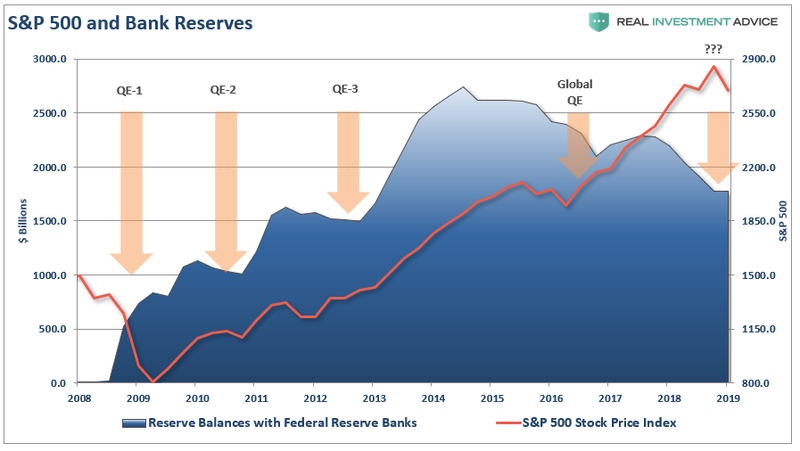 The chart above shows excess reserves relative to the S&P 500(NYSEARCA:SPY). When bank reserves have previously declined, it was in the midst of market turmoil. It was then either the Federal Reserve, or global Central Banks, injected liquidity into the system.